Our family is so blessed this year to be celebrating not one, but THREE upcoming weddings. (Actually it will be four, but that's a blog for another day.) 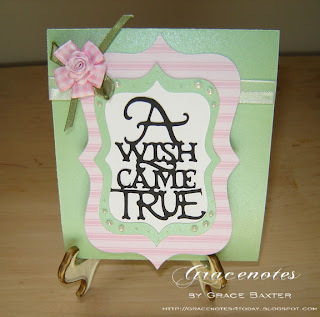 This card is for my niece, Crystal and her fiancé Scott. I love the pink and green combo so much, I decided it was the right colour scheme for this engagement card. Normally, for a such a card I would look to the Sweethearts cartridge. However, ever since I bought the Storybook cartridge, I have been thinking thoughts of romantic engagements and weddings. This cart has the sweetest designs, and it just made sense when thinking about a beautiful wedding day for this young couple. I also wanted a card that opened differently than the standard fold and this one filled the bill. 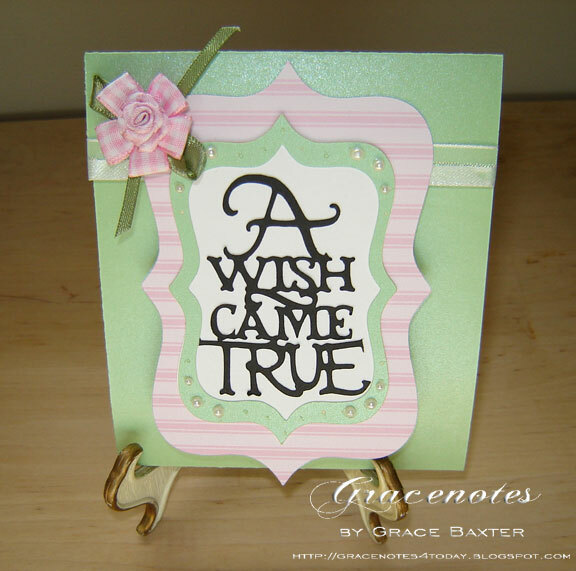 The front sentiment is layered between a white background and a green frame, which was cut one size smaller than the pink frame. In cutting the green frame, tiny holes were cut which seemed to cry out for pearls. So pearls I added! The pink and white flower is from a longer strand, purchased in the sewing department. 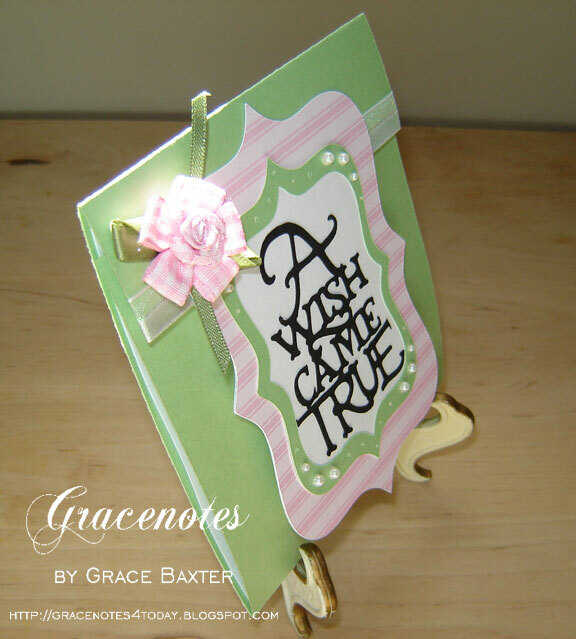 I also added a satin and sheer white ribbon across the green flap behind the pink panel. This gave the lift-up front more definition. 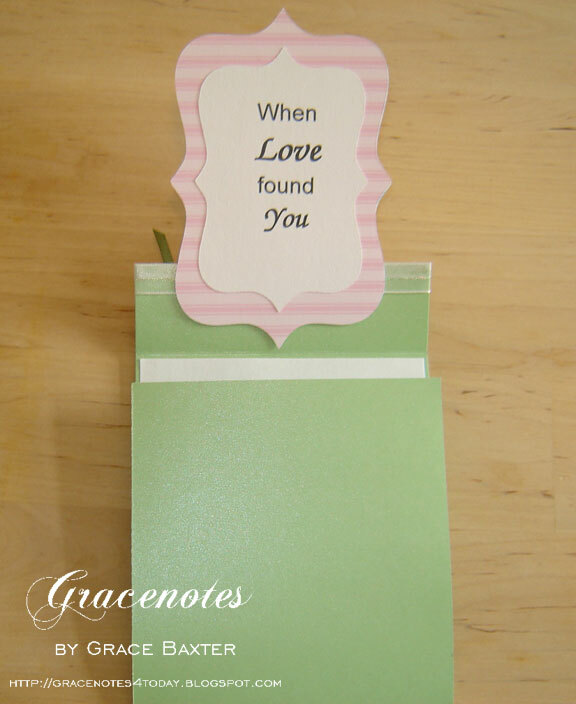 This style of card gives you a lot of areas to place things. I could have added something to the green front which would be seen when the pink flap is lifted. I experimented with that but I prefer the simplicity of leaving it plain. Fully opened, the center area is for the main message. I typed a personal note on plain white and adhered it to this spot (blanked out to the world). Then I created an embossed embellishment for the bottom panel. You could use a swoosh, flower, hearts, etc. But I liked the sentiment "Together Forever". I am actually taking a risk posting this card before it is even mailed to the recipient. Sshhhh... don't tell. Beautiful! You should add a Followers tag. I would love to follow your blog!